Once devoid of gourmet-grocery options, Hell's Kitchen got a one-two punch with the opening of both Brooklyn Fare and this block-long food mall. 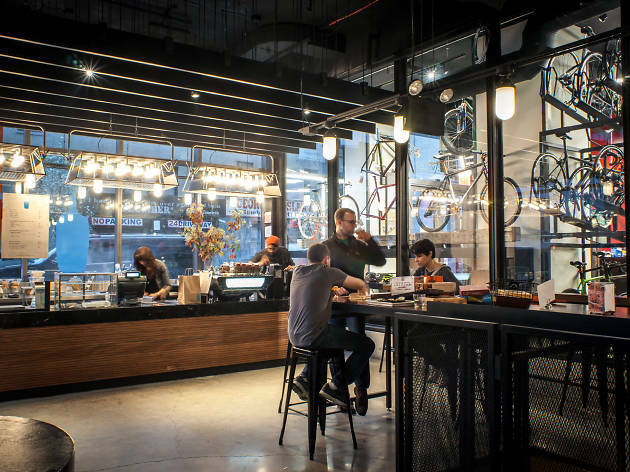 With a whopping 15,000 square feet, the retail-dining mecca is divided into eight culinary stalls—such as Blue Bottle Coffee and Brooklyn Kitchen—as well as a full-service NYC Velo bike shop. 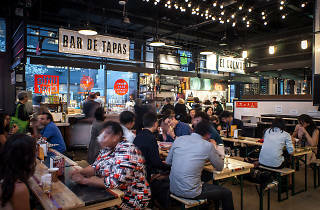 The food court includes Ivan Ramen Slurp Shop, where the noodle guru offers his famed shio, shoyu and chili-sesame varieties; Choza Taqueria, a traditional Mexican taco and burrito joint with Southern Californian flare from Dominic Giuliano (Punch and Judy, PS 450, The Volstead); and El Colmado tapas bar from Seamus Mullen (Tertulia). 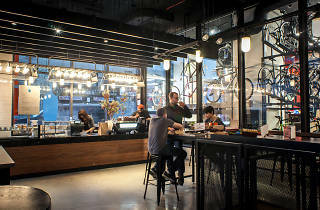 At the center of the expansive space are communal tables, with garage doors opening to sidewalk seating outside El Colmado and the Cannibal's cocktail-and-charcuterie post. I used to work across the street and working on 11th Avenue, there aren't a lot of options. Luckily Gotham West had a bunch of options. My favorites were Genuine Roadside's salad and the Choza tacos. Great to be able to eat outside! This was such an ideal local to have during my stay in New York - whether you're after pizza, ramen, tacos, a sushi burrito, tapas, sandwiches or all of the above at the once this place has you covered. It's not cheap but everything I got around to trying was delicious and more than sufficiently filled the lunch-shaped hole I was suffering from. This has been one of my favorite food halls. Gotham West has a great selection of different cuisines from burgers to ramen to tapas and even beloved Ample Hills ice cream. You can easily spend a whole day. Bonus tip, sit inside Genuine Roadside for some board game fun. Really nice open food court/event space concept with high-end vendors and lots of options. To name a few highlights: fried chicken sandwiches from Genuine, ramen from Ivan Ramen Slurp Shop, market fare from the Cannibal (as well as a full bar, ice cream from Ample Hills Creamery, coffee from Blue Bottle, and salads from Indie Fresh. There is even more to choose from, the open tables are welcoming (though can get a bit crowded, or family style), and the way each vendor surrounds the space makes it feel pretty all encompassing. Highly recommend for the area, a bit pricey but certainly high quality. Gotham West is probably the best food court in this area. Went there a couple times and it seems that every restaurant there was solid. Great food court. I used to go here for lunch when I worked in the area. Genuine was my favorite place to eat there. Lots and lots of seating both inside and out. And they have Ample Hills ice cream! If you're ever on 11th Ave,in the area and hungry, stop by! Every time I come to Gotham West, whether it is for client lunches or just to enjoy myself with friends, I have a great time and always seem to find something new! All the vendors provide phenomenal service, but I specifically love Genuine Superette. They have the best fish tacos and burger, you have to try it all! I've been to several of the stands within Gotham West and I've never been disappointed. Everything that Gotham West offers is absolutely delicious - Genuine's portobello burger and El Comado's spanish tortilla stand out as must-trys- and it's also an amazing event venue. If you ever have the chance to attend an event here - go! The cocktails are amazing and the space is totally transformed at night. An excellent environment with some great choices for lunch. Definitely one to look out for. 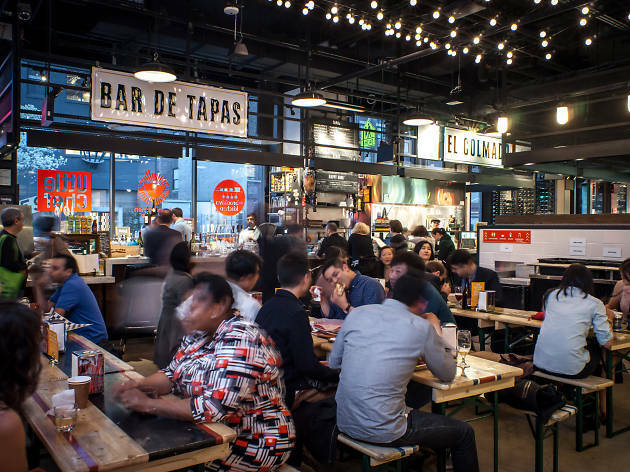 Gotham West Market is a diamond in the rough and has a little bit of everything. The burgers and sandwiches at Genuine Roadside don't disappoint, El Comado has delicious tapas, and if you have any room left over, stopping at Ample Hills Creamery for homemade ice cream is a must! You can't go wrong with any flavor they make, but try the "Hell's Kitchen Sink" concoction of salty and sweet. All of this variety is available in a bright, casual atmosphere that gives anyone in far West Midtown neighborhood an awesome haven of some of the best food the city has to offer. Almost everything I've tried here is top notch - totally unique and special food. The ice cream, the ramen, the sandwiches are all amazing, but I would especially recommend sitting at the window if it's nice out and getting tapas. The tapas I had became one of the best meals I've ever eaten in the city. They also have an interesting wine selection (including wines on tap) that is great. The only thing I would skip at GWM is Genuine - totally overpriced and not that tasty.